The deliberate slaughter of bison straying from Yellowstone National Park - killed because the brucellosis they may carry might endanger livestock - provokes a storm of protest, and calls into question the concept of wildlife management in the park. 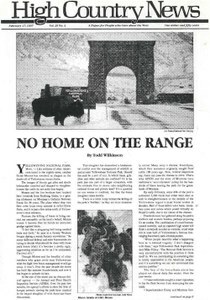 The history of bison in Yellowstone National Park is a century of human manipulation of wildlife. The federal agency APHIS has broken scientific protocol by experimenting with a live brucellosis vaccine in bison herds in national parks and a national wildlife refuge without knowledge and consent of the Park Service. Yellowstone National Park photographer Jim Peaco, in his own words, on the bison slaughter. While the Yellowstone bison are slaughtered , south of the park near Grand Teton National Park, cattle have grazed next to brucellosis-infected bison and elk for 75 years with no problems. In his own words, Mac Carelli, owner of C&C Meats in Sheridan, Wyo., describes how he deals with bison carcasses. Life at 25 below in towns like Livingston, Mont., is made bearable by things like poker, polar fleece and Portabello mushrooms. The new group, the Grand Canyon Private Boaters Association, seeks to unite private river runners as effectively as the professional boaters. The Denver-based Rocky Mountain Land Use Institute holds a conference March 13-14. A report by the National Parks and Conservation Association says that gateway communities suffered big economic losses when national parks closed during the 1996 government shutdown. ASARCO Inc. is offering tours of its giant Mission Mine near Tucson, Ariz. The Seattle Times has reprints of its five-part series documenting how the deregulation of tribal housing offices led to some tribal leaders building huge mansions for themselves while the majority of Native Americans live in substandard housing. Native plant societies help gardeners learn to cultivate their state's home species. The Nature Conservancy's report, "America's Least Wanted," lists the 12 most threatening invaders of U.S. ecosystems. Mark Wattles' 50,000-sq.-ft. Oregon mansion; bee power in Colorado; snail ranching in Oregon; repelling geese with grape spray; Sen. Craig defends Bobby Unser's wilderness trespassing; Valentine's Day "boudoir in the sky" in LA. Out for birds at N.M.'s Bosque del Apache Wildlife Refuge; HCN board meeting in Socorro, N.M.; 19,000 readers; subscription raise; obituary for Ruth Hutchins. Recent maulings and a death caused by wolf-dog hybrids leads to talk of legislation in Colorado and discussion elsewhere in the West about the dangers the wolf-dogs pose. A Utah County's decision to permit helicopter skiing on a private ranch raises opposition from residents and backcountry skiers. Big Horn, Wyo., residents who lost a lawsuit to stop a resort and 600-home development get revenge by ousting one of the county commissioners who allowed the development. Who wins when a river returns? A project to restore a riparian ecosystem would return water to California's Lower Owens River. Environmentalists urge President Clinton to budget more money for public lands and conservation in a difficult era of cutbacks and competing causes. The non-native weeds covering Mount Sentinel in Missoula, Mont., prompt an emotional debate over the possible use of pesticides to eradicate them. The Idaho Fish and Game Commission opposes the U.S. Fish and Wildlife Service's plan to restore grizzly bears to the state.